What do your mirrors say? but hasty shortcuts lead to poverty. Good planning and hard work do not always go hand-in-hand for people. Some people plan but never execute. Others work harder than what should be humanly allowed, yet never seem to succeed. Hard work should include smart work, and diligent planning is vital. This mail is not going to be about the best practices of planning but I do want to give an important piece of advice regarding your growth journey. You need to listen to your mirrors. On any flight, you are instructed to first put on your own oxygen in the case of an emergency before you assist anyone else. The logic is simple. You are useless to someone when you are dead, or busy dying. First, put on your own mask, then you can help someone else. In life, it works the same way. You are counterproductive when you are stupid. First, educate yourself and grow your capacity before you instruct others. Self-development is something you should do for your entire life. This is where your mirrors come in handy. Every situation in life has the potential to reveal something to you about yourself. When you are humble and teachable, you will allow every situation in life to teach you something. It becomes a mirror to reveal your character to yourself. You just need to learn the language of the echo. Just like this verse above teaches us, hard work without the proper planning (which includes good evaluation), will not prosper you. Here are 5 easy steps to evaluate a situation. How could I have acted more lovingly? Why did I react the way I did? What did this really reveal about who I am? If you struggle with these answers, get someone to help you reflect. When you answer these questions about honesty, you need to evaluate the answers. 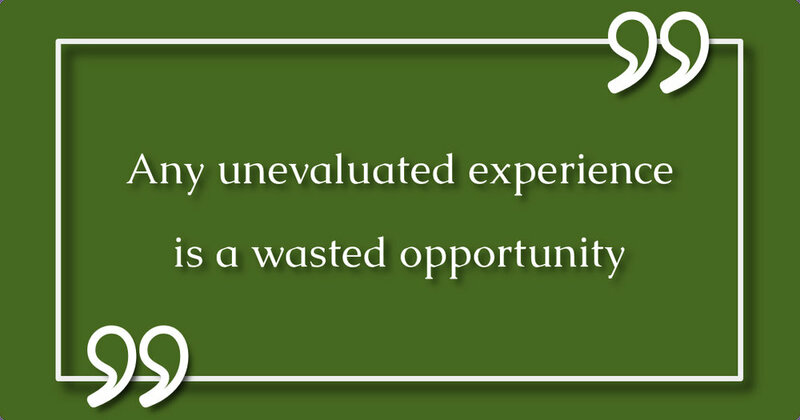 Any unevaluated experience is a wasted opportunity. There are a few questions you can ask to make any experience a learning opportunity. What can I do differently next time? What would I need to change about myself in order to do this? Are there any habits in my life that lead me to act the way I did? How will my life and behaviour be different when I stop these destructive habits? Are there any results form my behaviour that I would need to make amends for? What can I do to fix what got broken? This talks about taking responsibility for your own behaviour, especially when integrity is revealed. When you can be honest about your attitude and intentionally look to improve your behaviour, you can take responsibility for your life and grow. Who would be the right people to help you make these adjustments in your life? Talk it through with someone and discuss your desired outcomes. What would you need to learn to be able to help you achieve these changes? To learn new skills and acquire new knowledge is an important aspect of self-development. When will you do this? Without putting a timeline to it, you will end up procrastinating. Put an end date to your plan and stick to it. Write down clearly what your motivation is for wanting to make these adjustments in your life. Unless you are moved by the right motivation, you will not follow through. There is no point in designing a plan and leaving it at that. It's great to see it written down, but do get someone involved to help you achieve your change. Successful accountability requires a certain way of measuring results. Have a specific quantifiable score written down. Give your accountability friend full authority to challenge you and put consequences in place for not achieving your deadlines or goals. Be intentional and serious to improve yourself. To celebrate is very important. Celebrating joyfully releases dopamine, the feel-good hormone into your brain. This will result in more than just a goal being reached, but it will contribute to an internal feeling of satisfaction, thus truly rewarding your inner self. This celebration can become addictive and motivate you to keep growing yourself. Never achieve anything without celebrating it thoroughly. Newer PostAm I still ok with Jesus? Older PostAre you in the right environment?